Compared to the Multisports wheelchair, it is less comfortable and more difficult to manoeuvre. It has been designed with little input from the user and it is for general use. 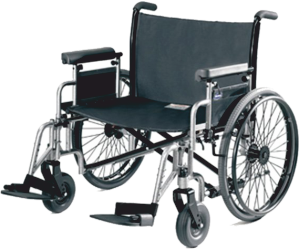 The wheelchair is also heavier and less stable, although it is manufactured from tube. The wheels are more difficult to turn by the user and when been pushed from the back. The wheelchair aids the independence of the user, but not to the same degree, as the multisports wheelchair. The Multisports wheelchair is lightweight due to its tubular structure. It is an innovative design and offers a greater degree of independence to the user, compared to the traditional wheelchair. It allows the user to get involved in sports, even at a competitive level. 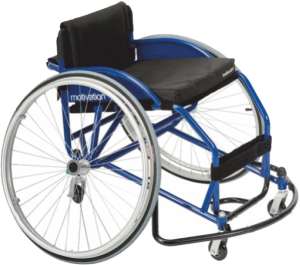 The wheelchair is extremely stable, as it has a supporting caster at the back, which prevents tipping. The wheelchair is highly manoeuvrable. This chair develops the users confidence, to a greater degree. Can you think of another apsect of life, for which a wheelchair needs developing. For example, a tough and durable wheelchair, that allows disabled people to access the paths used by walkers.